Key business decision makers from Australia and Singapore recently completed a one-of-a-kind familiarisation trip (FAM) to Sarawak. Organised by Sarawak Convention Bureau (SCB), the trip’s purpose was to shed true light on the State, its unique wildlife and beauty, traditions and heritage, culture of hospitality and world-class business events facilities. 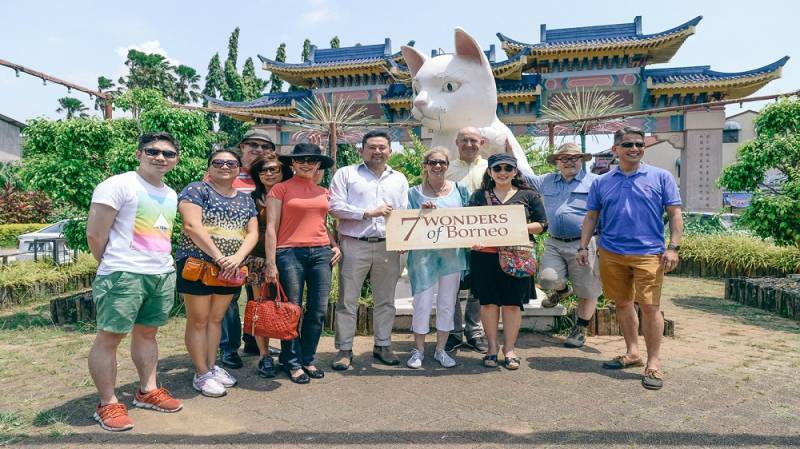 Ms. Amelia Roziman, Global Marketing & Communications Director, explained that the FAM trip was organised as part of SCB’s “7 Wonders of Borneo” campaign – an essential part of SCB’s 2015 strategic plan to showcase what Sarawak has to offer to some of the regions most established markets. SCB’s clients visited the main attractions in Kuching, Mulu and Miri, including the Kuching Waterfront, Semenggoh Wildlife Centre, Sarawak Cultural Village and Gunung Mulu National Park. In addition, they had the opportunity to visit various hotels and venues for their future events in Sarawak. SCB’s programme also allowed their guests to experience the social activities of the FAM trip, which included the internationally-acclaimed Rainforest World Music Festival and Kayaking at Kampung Semadang. These activities were an integral part of the agenda, allowing SCB’s clients to better understand Sarawak as a holistic business-events destination, and what they could consider incorporating in their own business events programmes. “We have such strong support from the industry and this FAM trip is the result from our efforts as an experienced and matured industry player. Many thanks to our main supporter, Malaysian Airlines (Sydney), as well as Cat City Holidays, CPH Travel Agencies, Planet Borneo Tours, Hilton Kuching Hotel, Mulu Marriot and Spa, Meritz Hotel, Borneo Convention Centre Kuching, Sarawak Tourism Board and Event Horizons Management for making this FAM trip a great success,” Amelia added. In addition to the FAM trip, SCB has actively fed into the Australia and Singapore market by attending international trade shows, meetings, corporate events and work closely with the international trade media under the banner of “7 Wonders of Borneo” Campaign. For more information on the FAM trip, please contact Mr. Mike Cheng, Communications Manager at mikecheng@sarawakcb.comor call 082-242-516.